One of the giants of the trading card industry, Topps can trace their history all the way back to the 19th century and the American Leaf Tobacco Company. Topps has also been involved in producing comic books, games and a number of non-sports trading cards. Baseball and football cards, however, remain their best-selling products. Morris Shorin founded American Leaf Tobacco in 1890, but World War I and the Great Depression greatly hurt the industry. After numerous financial setbacks, his sons, Abraham, Philip, Ira and Joseph decided to take the company in another direction. Topps was founded in 1938, and their primary area of business was selling chewing gum. In 1950, they decided to increase gum sales by packaging them together with trading cards of Western superstar Hopalong Cassidy. Next up were baseball cards, and these quickly became the main focus of the company. Topps football cards were first manufactured in 1951 with the Magic set, but Bowman dominated the football card industry at the time. Topps would not release another set of cards until 1955, when the All-American set was created. 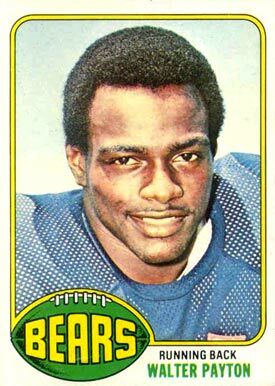 Soon afterwards, Topps bought out Bowman and quickly began to dominate the football card market. 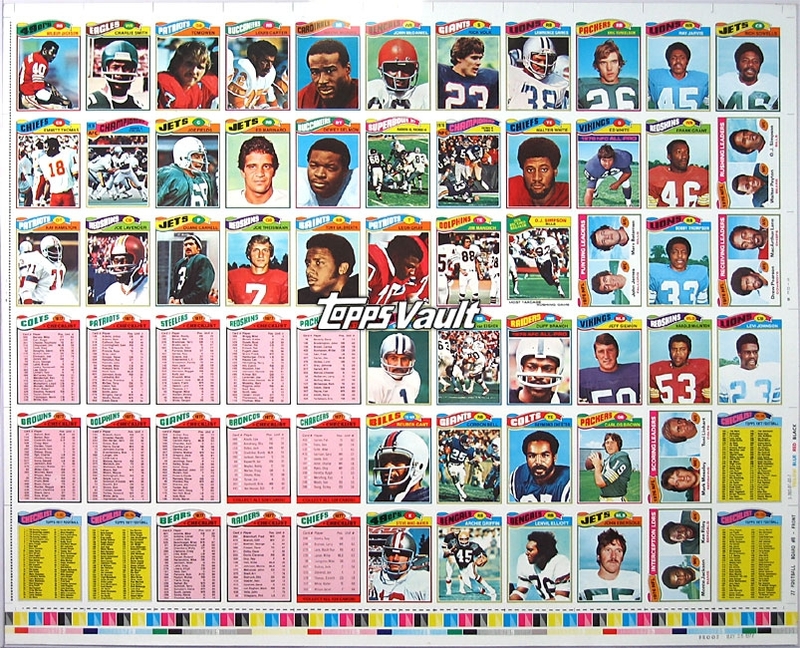 Topps has sold football cards every year since 1955, and they monopolized the market for many years. In the 1980s, they even sold cards of the doomed United States Football League. In the late 80s, companies such as Pro Set and Score began to challenge Topps� supremacy in the marketplace. On October 12, 2007, Topps was sold for $385 million to Michael Eisner�s Tornante and Madison Dearborn. Upper Deck had made an offer of $425 million, but Topps management rejected it, citing concerns over financing and antitrust regulation. If you�re thinking about starting a collection of Topps football cards, take a look at some of their most recent products below. It�s an excellent jumping-on point for any collector. 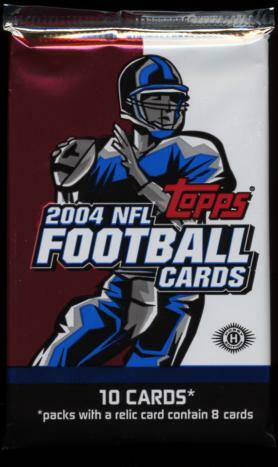 2008 Topps Football – Released on 7/16/08, this set of football cards has been one the company�s top sellers. Each hobby box includes one autograph or relic, and each HTA box includes two autographs. The set has a total of 110 rookie cards of players like Darren McFadden and Limus Sweed, and Topps Football Military Salute cards pay tribute to active soldiers who cheer on their favorite team every Sunday. Also included are Hall of Fame autographed cards, Super Bowl and Pro Bowl relic cards, special Brett Favre Collection cards, 285 veteran base cards and much, much more. 2008 Rookie Progression Football – Offers the first look at the NFL rookie class of 2008. There are 55 draft pick base cards, as well as 165 veteran base cards (Drew Brees, John Elway, Jon Beason, Reggie Bush, etc.). There are autographed draft pick variations, Senior Bowl autographed cards and 10 parallel cards per box. Two rookie autograph cards are included per box, as well as two relic cards per box. 2007 Triple Threads Football – Each relic card in this set is sequentially numbered, and every pack purchased contains at least one triple relic card and five numbered parallel cards. 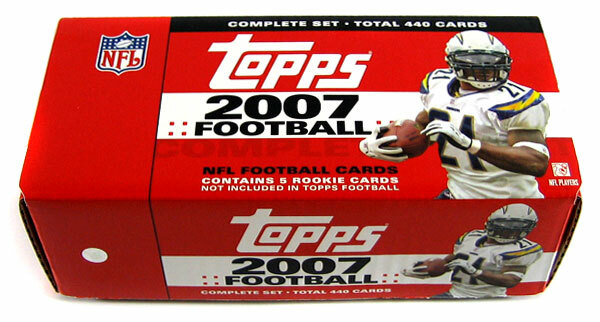 This 2007 set also includes the following cards: Triple Threads Heroes Relics (Jim Brown, Terry Bradshaw, etc. ), Triple Threads Combo Relics, Prime Relics and Triple Threads Dual Crest Rookie Relic Autographed Cards. Base cards feature 100 NFL veterans and retired players. 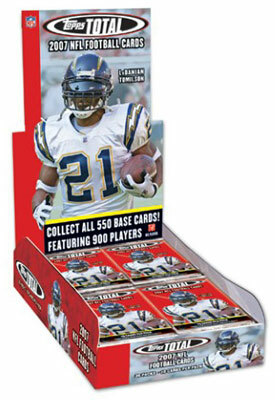 2007 Bowman Chrome Football – Released on 11/14/07, this set of Topps football trading cards contain one rookie card per pack and one autographed rookie card per box. Base cards include 110 veteran players, 55 rookie and autographed rookie variations (with players such as Adrian Peterson and Calvin Johnson). 2007 Co-Signers Football – Released in October of 2007, each box of this set includes the following: one autographed co-signer card, 10 low number parallel cards, 3 rookie cards sequentially numbered and one autographed rookie card. Dual autographed card are especially novel, as 50 NFL stars appear side-by-side on 50 cards, with both players� autographs included. Base cards include 50 veteran players, while rookie base cards feature 50 players with a bright future in the league. And just in case you�re wondering what those old Topps cards in your attic might be worth, here are some recent values to give you an idea.